I have been fascinated by portable bandsaw mills ever since discovering they exist. As one who hates making multiple hundred dollar trips to Home Depot for a single project I love the idea of just walking to the backyard to make some lumber. You always forget something at the Depot and have to drive back. On top of that the lumber they sell is not true to size. A 2×4 is a few tenths of an inch shy of actually being 2 x 4 inches. With your own mill you can make them any size you want. And that includes weird sizes that some projects might require. My hunt started on Youtube, then progressed to the Forestry Forum’s Sawmill section, and then onto actually checking them out, in person, at local fairs. Originally I was going to buy the Woodmizer LT15, but a hunt for a skidding winch brought the Hud-son brand to my attention. Hud-son is located roughly 4 hours away and was in the process of setting up a new dealer about a mile from my house. That bumped Hud-son ahead of Woodmizer even though Hud-son is known for having some weak rails. As an added bonus the Hud-son was a bit less and came with more saw. 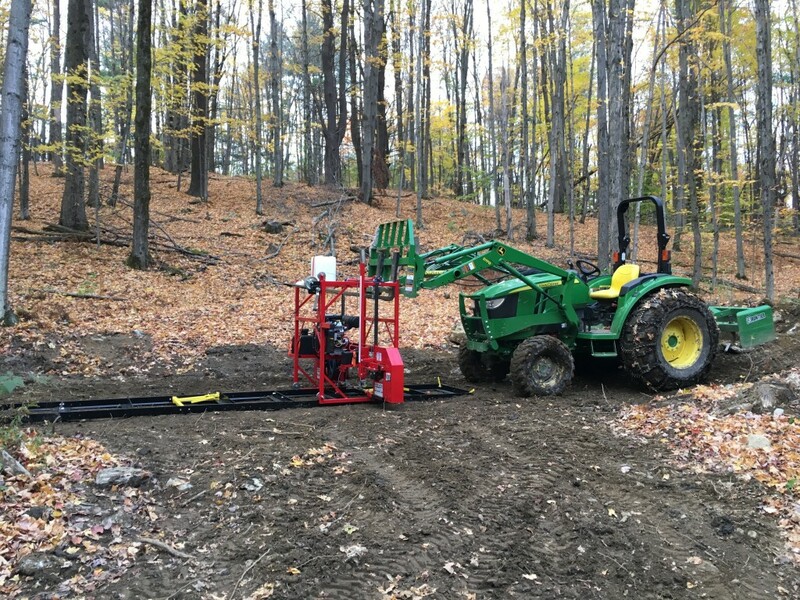 I got the Oscar 330 model because it could take a 23hp motor and saw logs up to 32 inches. There might be 2 trees on our property that would require that kind of power and width, but the rule of “buy more than you need” has yet to fail me. 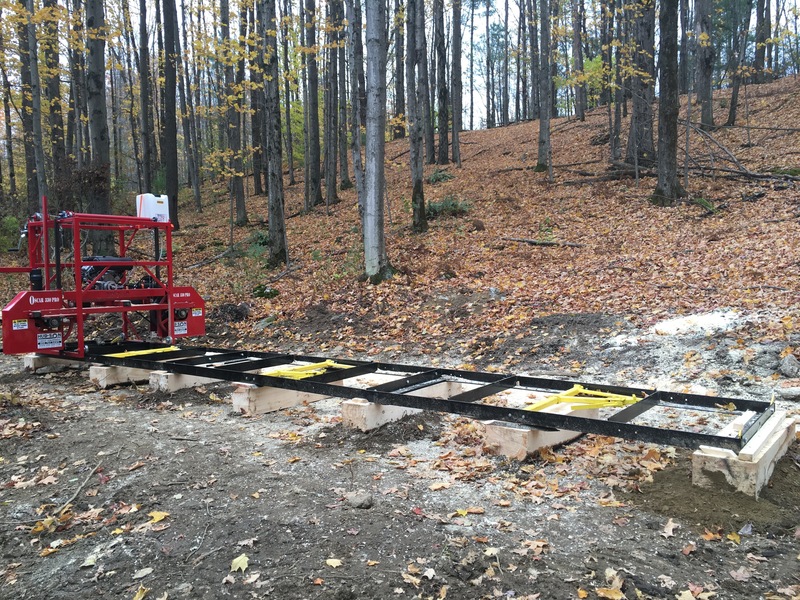 The Oscar 330 comes with 21 feet of track, but the saw eats some of that so a 17 foot log is the longest you can saw before needing to buy more track. I don’t have any plans to make super long support beams so 17 feet should do nicely. It uses Woodmizer blades which are available with a little help from the mailman. With the exception of the blade tensioning bolt tools for maintaining the mill are quite standard. You will need a 1 & 3/4 inch socket for the tensioner, but I’m using a 30mm one because that’s what I have on hand. I highly advise getting a zip tie for the water line as the stock setup can easily swing into the blade. I also had to buy some rust inhibitor for a few of the metal areas. Fortunately my dealer told me which ones and it looks like I don’t have any rust issues. Can’t say the same for my DR Power Wood Chipper. I never understood why outdoor equipment manufacturers don’t use rust proof parts nor apply the rust proofing themselves! So, with the Hud-son you’re in for a standard socket set, a can of Rustoleum, a large 1 & 3/4″ socket, and replacement blades aside from the initial purchase. You can also pick up a torque wrench for the blade tensioner, but I have found the hand-feel on the blade to be just as good as setting the torque wrench. Your mileage and hand-sensitivity may vary. 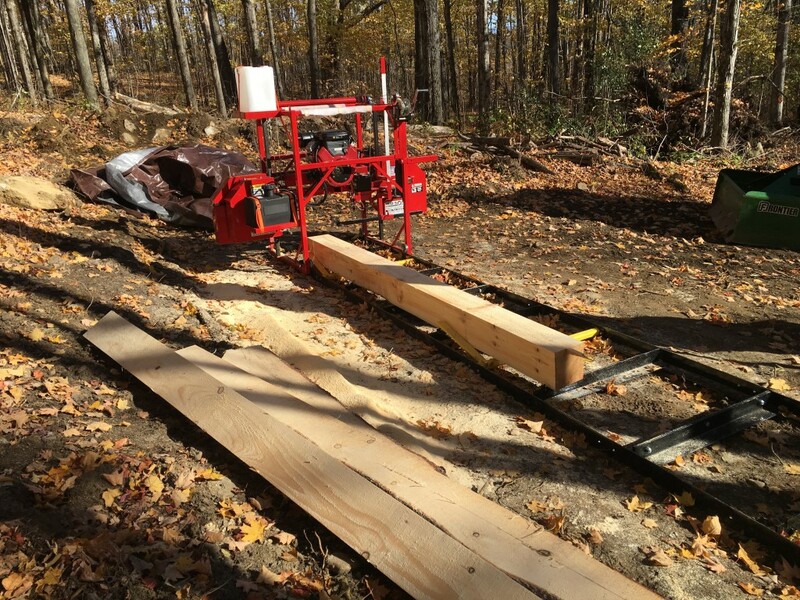 I have not milled enough lumber to make a sawmill recommendation, but with the amount of lumber needed for that project list I probably will. I have certainly made enough mistakes to fully maintain my rookie status though! Expect future reports.